CMS staff participated in the PGCC TeamBuilders Academy Fall 2017 Career Showcase! So exciting to see the students give their elevator speech and discuss their qualifications and goals. 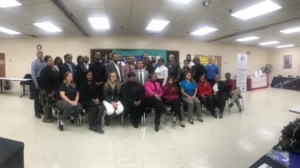 The TeamBuilders Academy (TBA) is a Prince George’s Community College Workforce Development Program, offering cohort-based accelerated adult career training. TBA’s mission is to provide job readiness-related soft skills training combined with occupational trade-related technical skills training. After instruction is provided to eligible Prince George’s County residents they are matched with local employers. TBA participants have the opportunity to enhance their employability while gaining vocational skills in a shared-learning model. TeamBuilders Academy staff and industry professionals provide soft skills training as well as technical training specific to the occupational track selected by each participant. This unique program training model was designed to be nationally benchmarked and supports achievement of professional credentials and industry-specific certifications. Additionally, each occupational training track is directly aligned with local employment opportunities. Prospective TBA participants are identified as eligible based on age (at least 18 years old), residency (Prince George’s County residents), and employment status (having encountered employment adversities). TBA offers training opportunities to veterans, the long-term and chronically unemployed, individuals with disabilities, and college developmental students who are non-completers. With assistance from program partners, referrals for training are received from local faith-based, community-based, and government organizations. After referral, prospective participants are screened for substance use and adverse backgrounds, appraised to measure cognitive ability and work-readiness levels, and then interviewed to determine interpersonal and communication skills and occupational interest. Participants successfully completing the occupational tracks will have earned one or more occupational licenses, industry certification, or other industry-specific credential verifying achievement of technical skill proficiency in the selected occupation. Before training is concluded, each participant will be given a post-test to mark learning gains measured against the pre-test, and to identify their employability competency skill (ECS) levels. Those achieving the highest ECS will earn a workforce skill certification (WSC). The WCS certifies for employers that the participant has demonstrated advanced skills in multiple skill areas such as reading comprehension, critical thinking, math, problem-solving, writing, teamwork, oral communication, and customer service, and provides clear documentation of readiness for entry-level employment. The TeamBuilders Academy engages its participants throughout their training with a variety of projects. Specifically, TBA participant’s engagement projects are designed to foster collaboration, in multiple ways- amongst the students, staff, and stakeholders.